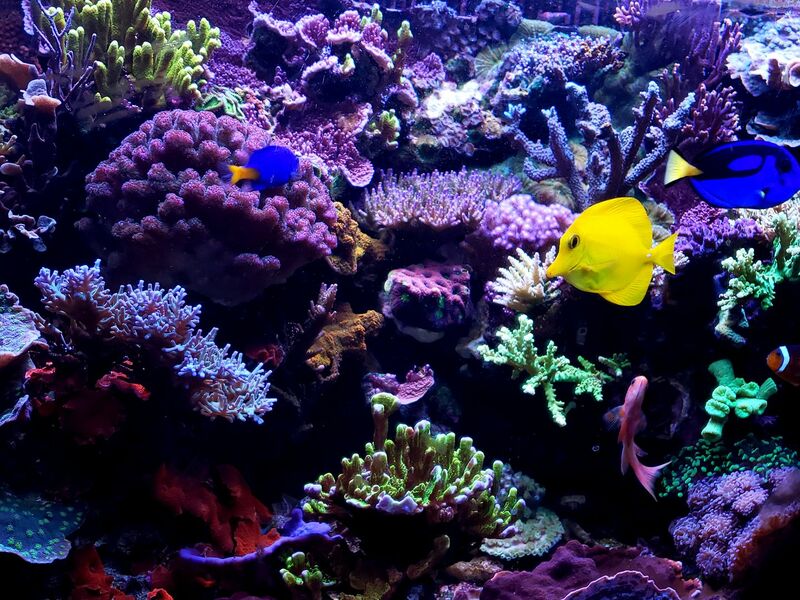 I have been using reef crystals almost for ever. When I tried a different salt I almost kill all. I have never measured anything beside the Alk of my DT. When I tried to achieve certain levels of, let say nutrients, again, I almost kill it all. After many years and reading hundreds of posting and from my own disasters, the best is to keep a system STABLE as much as you can. Just measure 1-2 parameters that could be a big factor in your tank. In my case it is Alk, as my tank is 90% SPS. 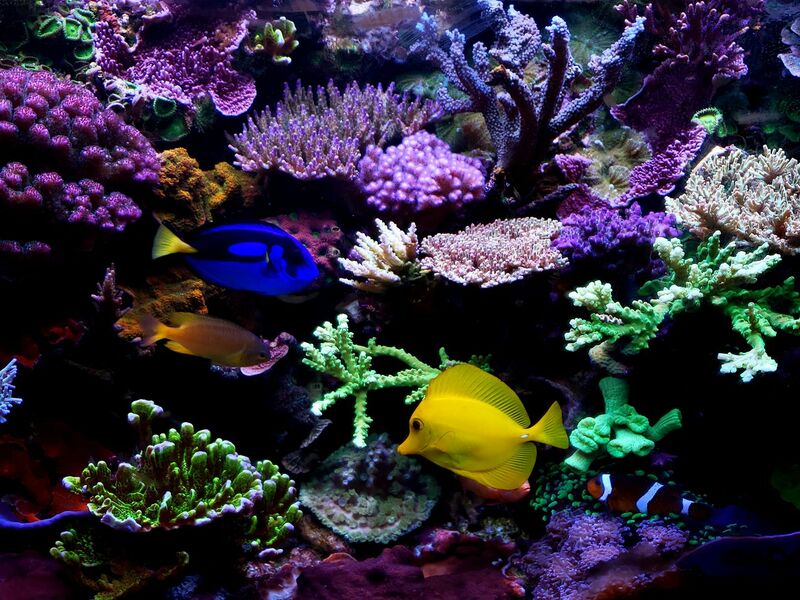 The corals will adjust to the "stability" of the tank. Some will die, for sure. 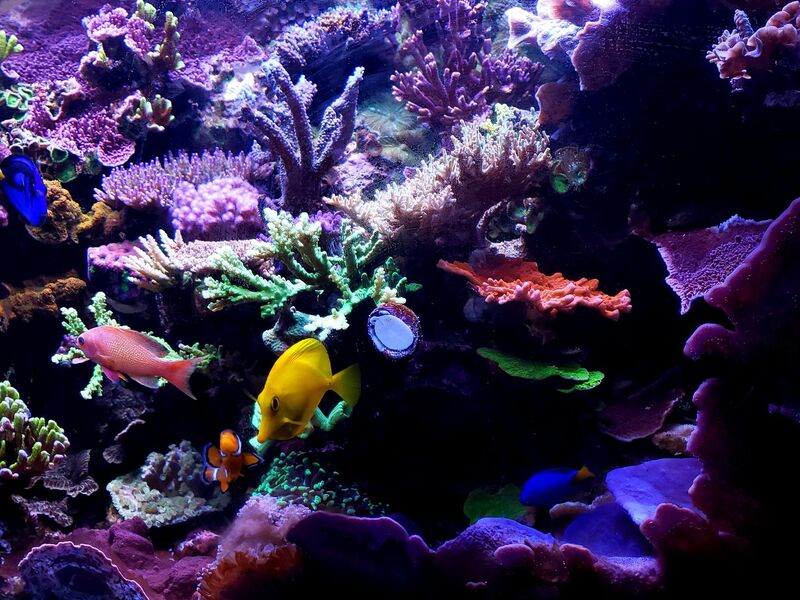 This is my tank after 3 years of NOT changing anything beside a 25% water change (reef crystals) every week, and keeping the Alk around 6-7 dkh. Of course plus standard cleaning when something needs it. But avoiding to put my hands in unless is imperative. Ps: sorry if this not answer your request of potassium data. But I hope it brings peace of mind about Reef Crystal salt. I hope that posting the picture does not bother you. But I like to show you my tank so you understand that my answer is based on real experience and not on a tank with 3 colonies on it . Do not change things, unless it is a real need. Or, you want to experiment, that many love to do as part of the hobby. JC, why do you choose to keep your Alk at 6-7dkh and what is the Alk level of your freshly mixed RC batch before the water change? Just in the last couple weeks have I begun dosing on my 39g. I also use RC, and found that the fresh mix has very high Alk (I believe it was around 11dkh or so). I feel comfortable number for my tank is 8dkh, and currently dosing for alk every 3 days, as it takes about that long to drop to about 7.3dkh. Some years ago I measured Alk in the fresh RC salt. I believe it was around 9 dkh. I do not measure anything in the fresh RC salt. This is what I do : once a week i change 25 G in my 100G total system. I pass RODI water to the Salt Water tank and add the RC salt. I let the new marine water wait till my next week change. It is in the reservoir tank for a week with a pump, heater and air pump. The brute is 32-35 G . As I take only 25 G I always have a residual. I never cleaned or emptied the brute in the last 3-4 years. I keep it closed. At the same time I do fresh RODI that stay for a week waiting until I change my 25G and pass it to the fresh marine brute reservoir. The RODI is not heated. So new marine water and new RODI water stay 1 week before I use it. Why ~ 6 dkh ? Because real marine water is around 7 dkh. It has always worked for me. Others use higher value and work for them too. The peak values in the below picture are my mistake entering the data. Thanks for the insight! I have noticed that the dkh does drop a little after letting the fresh batch mix for a few days. Not arguing that 6dkh is wrong, just too low for my comfort and so far so good with keeping my tank at 7-8dkh range. I know some people keep it at 10+, it's funny how far one tank can be from another and both equally successful! I agree with you that 7-8 dkh is very good. And you are correct too that there isn't 1 recipe to keep a successful tank. For me, Keeping it STABLE, at whatever level of XYZ parameter is the recipe. For some reason, my tank is always below 7, for as much I would like to have it at 7. So I gave up long time ago and it is much easier for me to have it nearby 6 dkh. Some closer pictures of the same day I took the previous one. Yea I do not know what my issue with coral color is. So I'm slowly trying one thing at a time until the colors improve. What do you have for nitrates and phosphates? As I wrote I do not have any idea of any parameter beside the salinity, Alk, Temp and Ph (because it is being measured by the Apex). I feed every other day always the same amount. Last time I tried to chase nitrates and phosphate almost killed all. Sorry I can't be more useful. 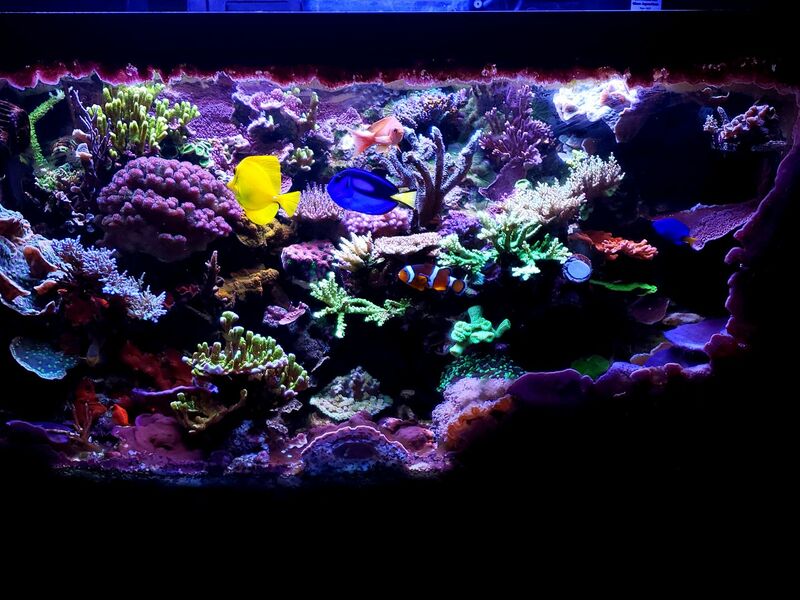 FYI, the pictured (65G) tank has a 40G fuge full of macro, Mangroves, corals, mushrooms and fish too. I can post a picture if you want. 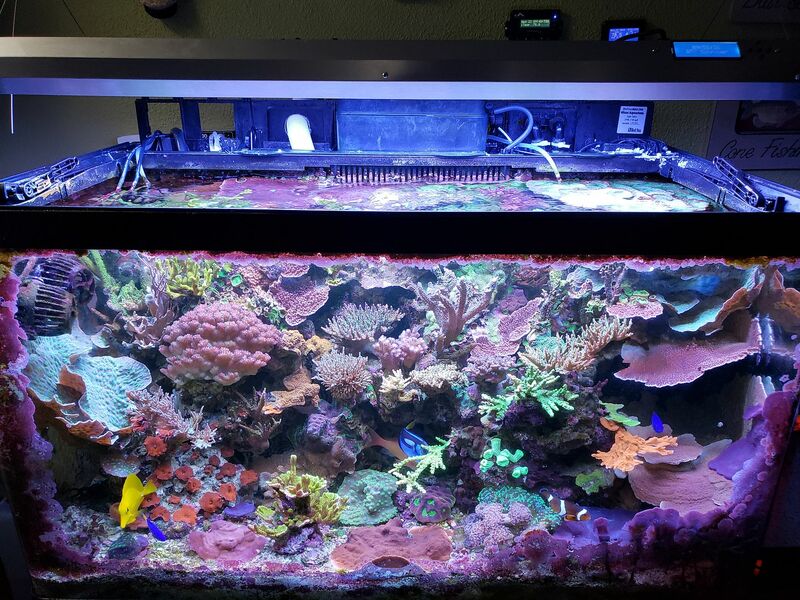 How much calcium and alk the tank consumed every day? That ATI 6 bulb is really really rocking! Hi Dong. I am using B-ionic 2 parts. This week I am in 107 ml of each solution. I Measure at least once a week and had to increase 2 ml this If those 107 ml are "precise" I don't know as I have not recalibrated the DOS since i got it ~4 years ago. There is no need to recalibrate when I adjust the dosing based on the Alk level. There is no magic touch . I learned from experts like you and from my own mistakes. JA JA JA..... Because you sold it to me !!! STABILITY..... for me is the key. If I wait a week for the new ballast and some days to find the time to replace it and .... who knows if I do it correctly and....and .... and... to many "and's" and the tank stability goes to hell. So it was faster to buy and place a new fixture.